We offer sparkers for every occasion! 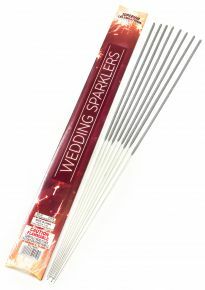 For weddings, the most popular product by far is our exclusive 20-Inch Wedding Sparklers. They burn for about two minutes, providing the perfect amount of time for the grand exit at the end of your wedding day. Also, check out our Bottle / Cake Sparklers for your next bottle or cake presentation! From wedding receptions to birthdays, night clubs to restaurants, these sparklers create amazing moments that everyone will remember. 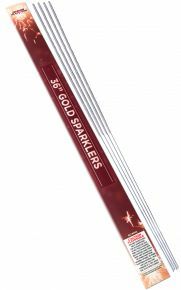 The rest of our sparklers, including the 10-Inch Gold Sparklers, 10-Inch Color Sparklers, and 36-Inch Gold Sparklers are great for any event, including birthdays and Independence Day celebrations. These wire, heart-shaped sparklers burn almost smokeless, bright gold, and have easy light tips (located in the center of the heart). They are perfect for using at weddings and receptions! 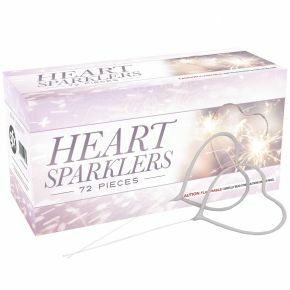 When lit, these sparklers burn down on both sides of the heart, creating double the sparkle of a regular sparkler! Star-shaped sparklers are a unique and fun way to celebrate birthdays, graduations, the Fourth of July, and New Year's! Plus, star-shaped sparklers burn down both sides at the same time, giving you twice the sparkle of a traditional sparkler! The golden sparks are bright and beautiful, and the wire core means they burn with minimal smoke. These specially formulated sparklers are perfect for bottle service and cake presentations. They burn with a near-smokeless, gold-sparkling flame for about 45 seconds. They measure 7.5" long and .5" in diameter and burn for about 45 seconds with a 6” to 9” sparkling gold flame.